This entry was posted on Tuesday, June 20th, 2017 at 11:35 am and is filed under animal crackers, simple pleasures. You can follow any responses to this entry through the RSS 2.0 feed. Both comments and pings are currently closed. 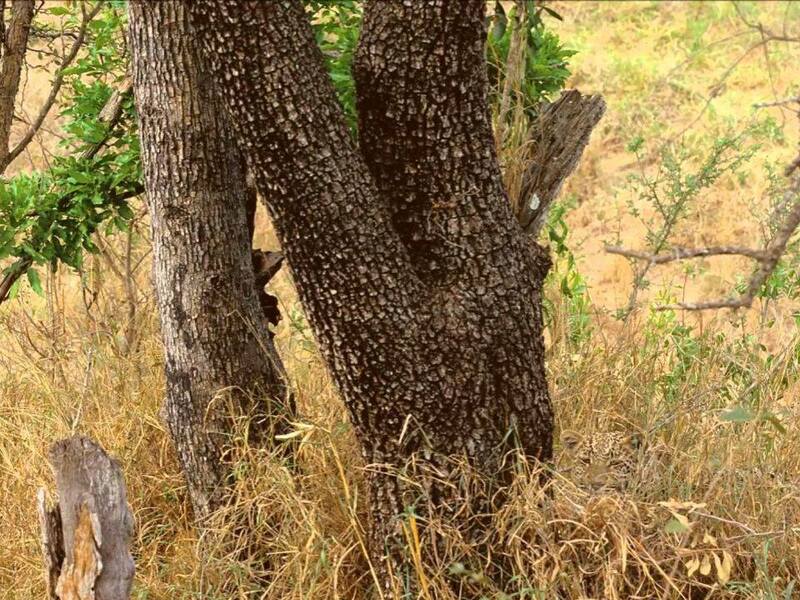 25 Responses to Find the leopard hiding in the savanna! Had to enlarge it this time but I did find that pesky little leopard. Meh. Easy Peasy. Er… Once I enlarged it and scanned thoroughly. The one on the left tree, hanging on a branch. EEEK!!! This gave me a flashback! The year was 1973. One lovely spring day, I took my 2 year old son for a walk along the isolated gravel road we lived on. Our home was in southern Missouri at the time, in the Ozark Hills. Thick forests surrounded us on every side. The nearest neighbor lived about a mile away. A small stream ran down the hill below the road. Thinking that he might enjoy playing near the water, I led my son through the trees to the bank of the shallow stream. As he was happily throwing rocks in the creek, I looked up — and there was a large panther, standing motionless on the other side of the shallow water. She was almost close enough to touch, staring at us, with eyes just like that leopard’s! Holy cats! That’s WAY to close for comfort. How did you react? In that moment, my emotions turned off. I felt no fear, no feelings whatsoever. Without taking my eyes off the panther, I very slowly bent forward, picked up my little boy, and slowly lifted him over my head and sat him on my shoulders. Then I slowly, quietly, carefully, turned and walked away… slowly, slowly, slowly, one cautious step in front of another. I still felt no emotions at all. I walked the 50 feet or more through the woods to the gravel road. Then, still moving just as slowly, with my son still riding on my shoulders, I walked the approximately 1/4 mile up a winding hilly curve to our house… I slowly crossed the wide front yard…. slowly climbed the 3 steps… opened the door, walked in, shut and locked the door behind me, put my son down…. and collapsed on the floor. I still don’t know how an “expert” would advise handling a situation like that. I have no idea if the typical panther would just stand there, with nothing moving but a twitching tail, if you were to take the same course of action. I only know what happened in my case. By the way, my husband (now ex) thought I was CrAzY when I told him what had happened. “There ain’t no panthers around these parts,” he sneered. A couple of days later, a neighboring farmer who kept a herd of cattle in a field along the creek near where I had seen the panther, found the remains of a calf that had been eaten by some kind of wild beast — with big cat tracks in the mud around the carcass. Thank You Lord Jesus for sparing my son and me! I just made a post out of my comments, with a link back here. Thank you for being a source of lighthearted inspiration, every single day!!! You are Awesome Sauce!!! Thanks so much for linking. I hope your doctor appointment went well. I flund it by half-closing my eyes. Worked a treat. …Proving that nature knows what it’s doing when it camouflages animals. Man, that was terr-bull hard! Even when I had actually seen enough in the blur that I was certain that I was looking at it, I still could not resolve it till it just popped up. Now, I can’t un-see it!